Some of the coolest space/sci-fi toys came out during the 1960s, and these little guys are a perfect example. They are tiny (under one inch tall) space aliens made by an old company called Giant, which produced different varieties of toy soliders, vehicles and other small plastic toys. According to this very informative article on the Plastic Solider Review website, the Giant company started out as the Rosenberg Toy Company in the 1940s, and then changed to Giant in 1960. By the end of the 1970s, it became known as Arco. I'm not sure the exact year Giant produced these aliens, but I'd guess sometime in the mid-'60s. 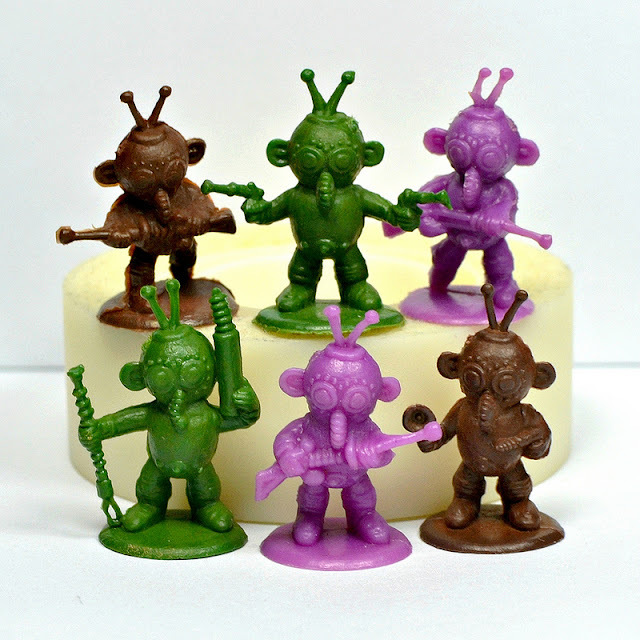 The aliens came in six different sculpts and three different colors -- green, brown and pink/purple. They are made of hard plastic. I love their simple yet very fun designs; they have a lot of detail and personality for being so tiny. They came with little circular UFOs they could be placed inside. Giant also produced a line of micro astronauts and spacecrafts called Space Knights, so kids could set up space landings for discovery of these little weirdos on different planets. You can see all of these different pieces on Plastic Soldier Review linked above. Funny thing ,Arco was bought out by Mattel in the mid 80's. This is in fact the same company that made the Toy line The Other World in the 80,s. Cool. I assumed that was the case, but wasn't positive. Not sure about back then, but I actually have seen scented figures before! Technically Giant was a brand of first RTC then Arco, the name-switch being around '61 when RTC moved from NY to HK and changed it's business model to FOB from Jobber, 'Giant' (as a brand) overlaps both. THANK YOU! I've been trying to ID these from a childhood memory for decades. I had a bunch of them when I was 4 or 5 and always loved them. Periodically (having no idea of who made them or what they were called) I ran web searches trying to find them. And here they are! You totally rock for posting and identifying these! Awesome, I am happy it was helpful! I have vivid memories of getting these guys in boxes of animal cracker-type cookies called "Moon Cookies", in the late 1960's. Instead of animal shapes, the cookie shapes were rockets, saucers, etc. Each box had one of these guys inside. I still have one of them that survived. We could get them for a year or so in a Piggly Wiggly store in a small town in Texas, so it must have been fairly widespread. Cool, that's the first I've heard of them being released that way!